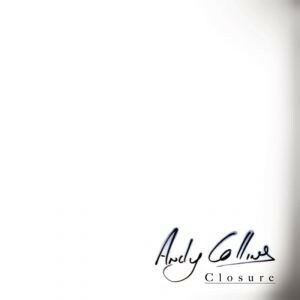 Best known for his time with the Welsh Westcoast/Country act The Storys, who split in 2010, Andy Collins has for the last year been working on his first solo venture - the aptly titled ‘Closure’. As an album ‘Closure’ doesn’t really move its focus too far from the style that gained Collins previous band such a strong reputation. Giving a confident nod towards Tom Petty and The Eagles, with its easy going acoustic vibe, (something possibly over emphasised as the CD progresses) ‘Closure’ certainly draws you in with its dreamy hooks, even if it for the large part avoids any temptation to “rock out”. While a number of The Storys members have now gone on to release solo albums, ‘Closure’ actually brings most of that band back together, with guitarist Rob Thompson and multi-instrumentalist Alan Thomas, as well as Steve Balsamo who adds acoustic guitar, all making appearances. The trio are also heavily featured, alongside Collins in the writing team for most of the songs on this album, explaining why it all sounds so reassuringly familiar. The vocal interplay between Collins, Thompson, Thomas and guitarist Matt John really is a highlight of this disc, as is the clear, sharp production courtesy of guitarist and drummer Tim Hamill, which allows the songs the room they need to breathe. ‘All The Things You Dream Of’ illustrates this perfectly, with lap-steel guitar soaring and swooping over a beautifully picked acoustic guitar line as Collins delivers one of many impressive vocals on show. Following a similar vibe, the sharply precise ‘Believe’ opens the album with an eerie, yet comforting approach that offers an intriguing introduction to ‘Closure’ that could possibly have been explored further as the album progresses. If I could, as already hinted at, level a criticism at this album, it would be that its polite restraint is almost too strictly adhered to, with only the strongly Petty flavoured ‘The Flow’ and the sprightly ‘Two Horse Race’ really offering a much needed change of pace. That said the harmonica that infuses a stronger Country flavour to ‘Something New’ and ‘Story Town’, does offer another slight change of focus. An album to sit back and relax to ‘Closure’ doesn’t reinvent the wheel, neither does it grab you by the throat and give you a good shake. However let its gentle charms and sumptuously crafted hooks take effect and you’ll find yourself singing these subtly crafted songs for days on end.